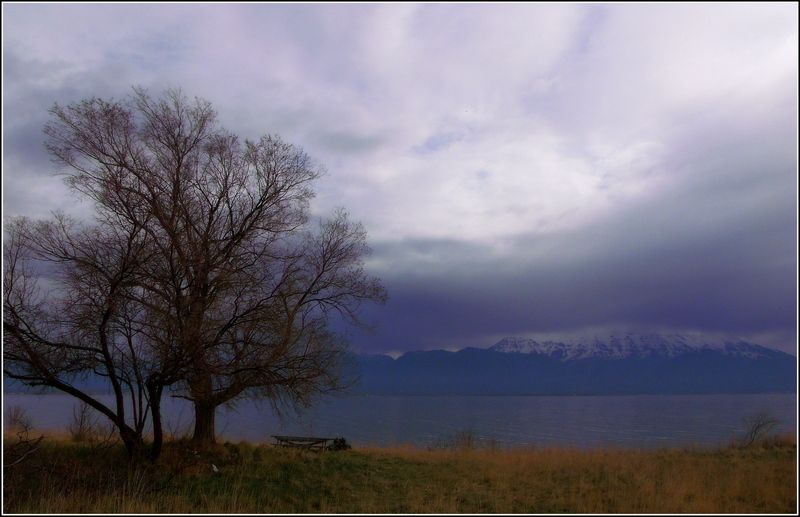 Some final images, maybe, of our quickly fading Fall…. 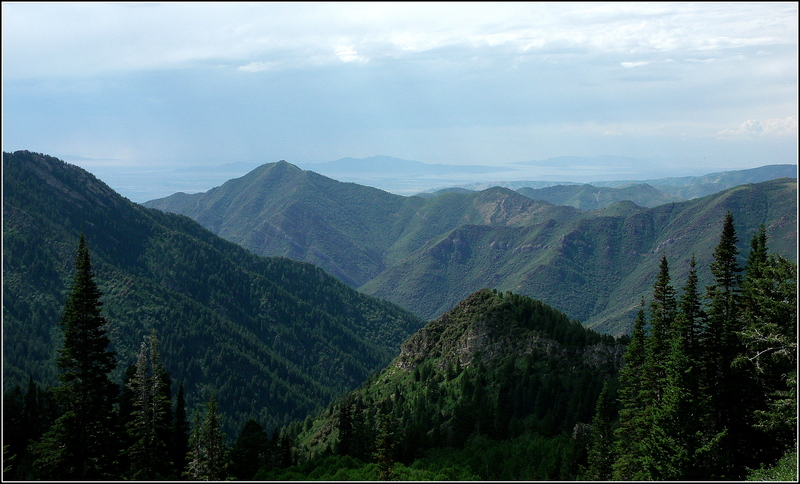 When hiking in the Wasatch Mountains, depending upon one’s elevation, one can see past the mountaintops and into the beyond…and in this case, out into the Great Salt Lake…where one can discern the familiar silhouette image of Antelope Island…approximately 30 miles to the north and west. 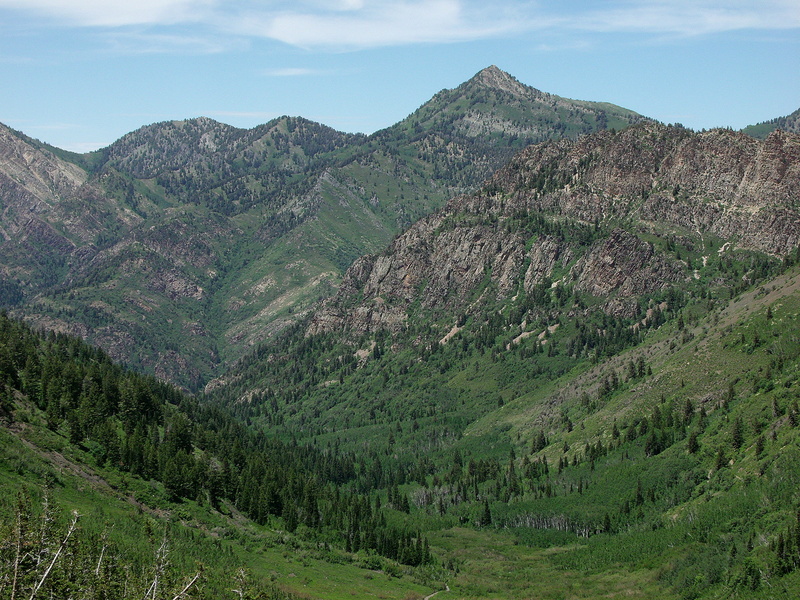 I made this image from the mountainside in Bowman Fork, one of the tributary drainages that run south from Millcreek Canyon…just east of Salt Lake City, Utah, USA. 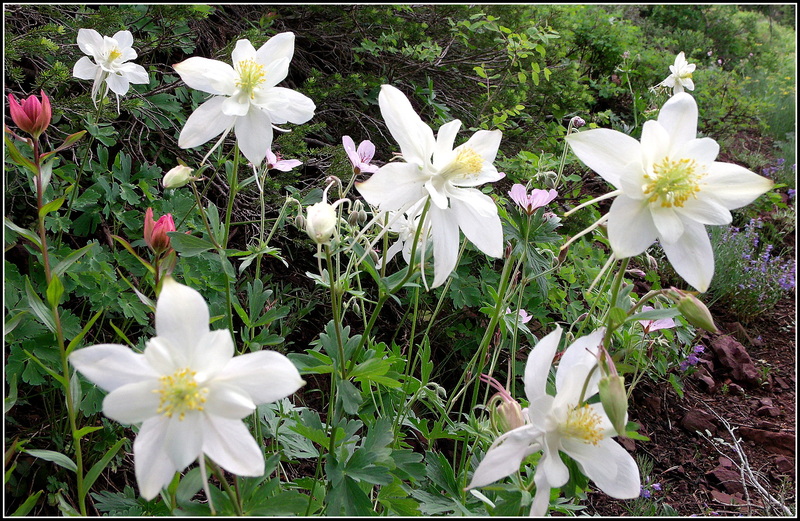 Mineral Fork in June…part two…. Here we are again, picking up where we left-off at the end of the other post, Mineral Fork in June…part one…. 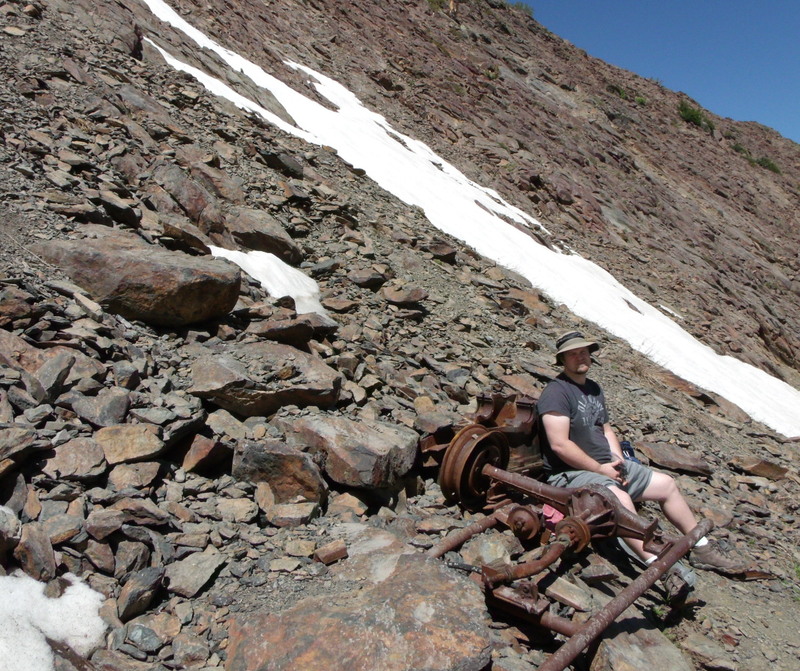 This is the mining artifact that we couldn’t really see at the end of the trail in the next to last photo of the other post…and this is also the location where I was standing when looking down upon the person and trail in the very last photo of the previous post. And another “people shot” below to help add some perspective to the grandness of the location…. 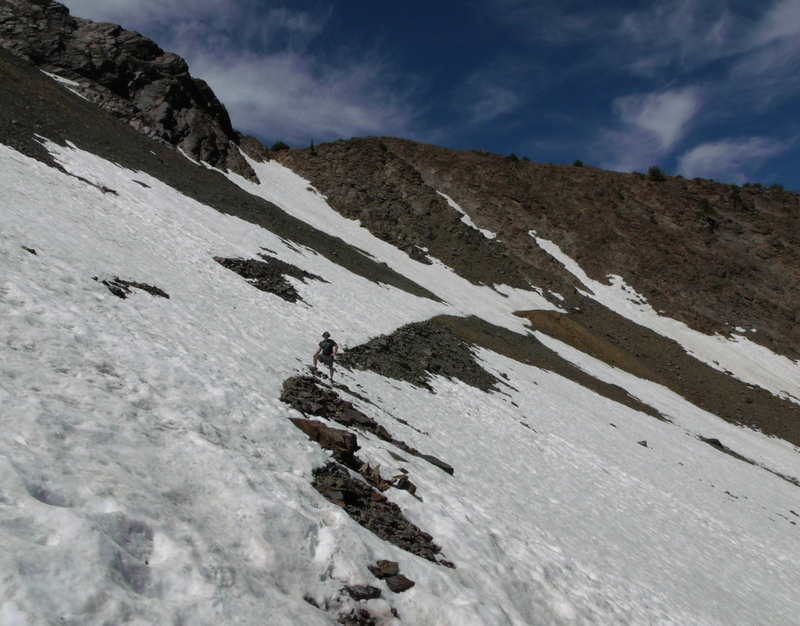 The below photo shows the trail in August of last year, 2012…taken at essentially the same location…so you can see how much of it is covered with snow in the above photo. 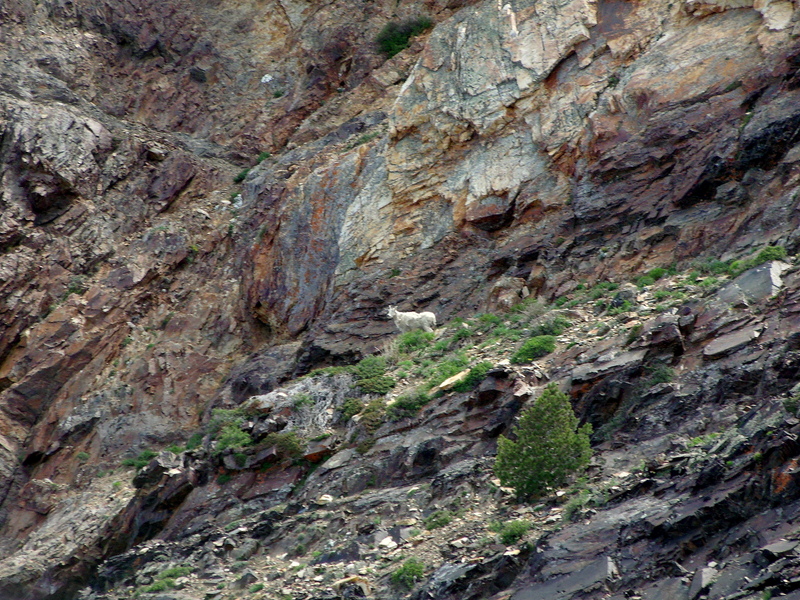 This is my first sighting of a mountain goat out in the wild, ever. 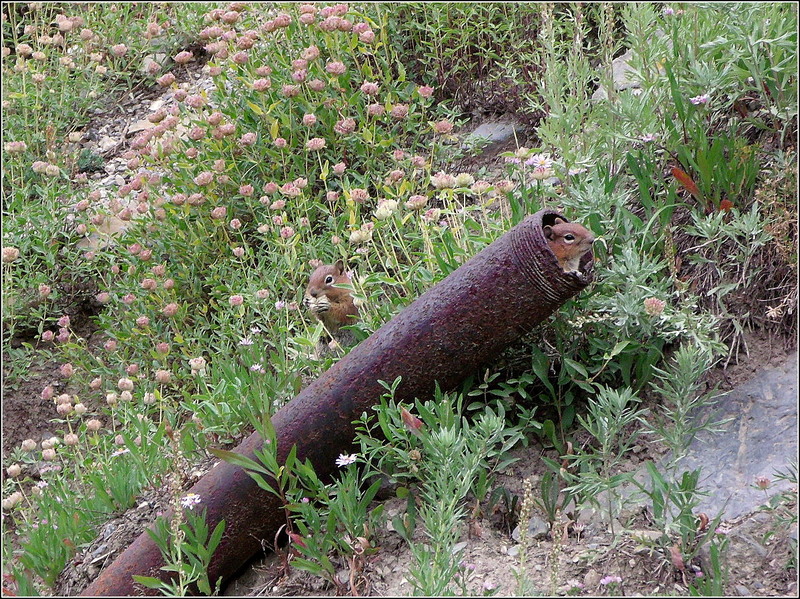 I’ve heard and read that they were in the area….and are usually found very high in the more rocky aspects of the Wasatch Mountains…. 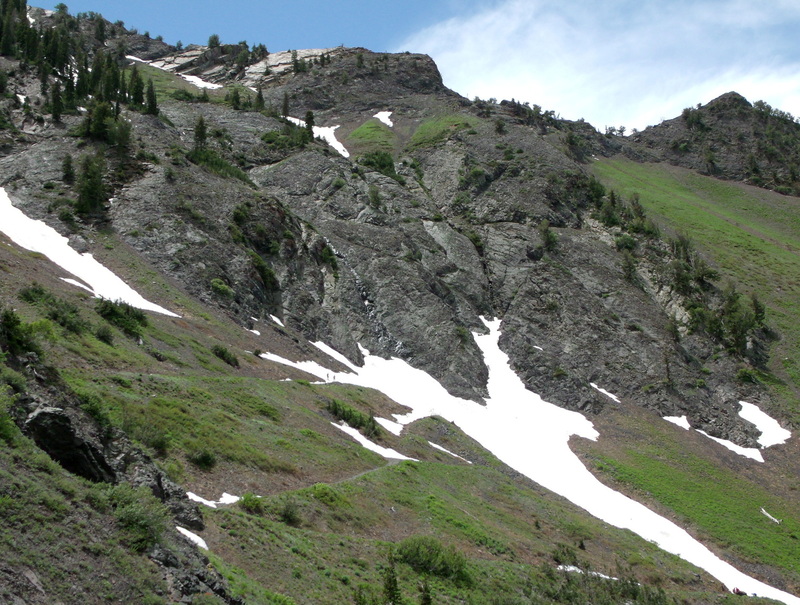 This one happened to be waaaaaay up on the side of the cirque, or bowl, at the end of the fork/valley….and I was waaaaaay down on the trail, so this is the best photo that I could get…but you can still tell what it is…right? 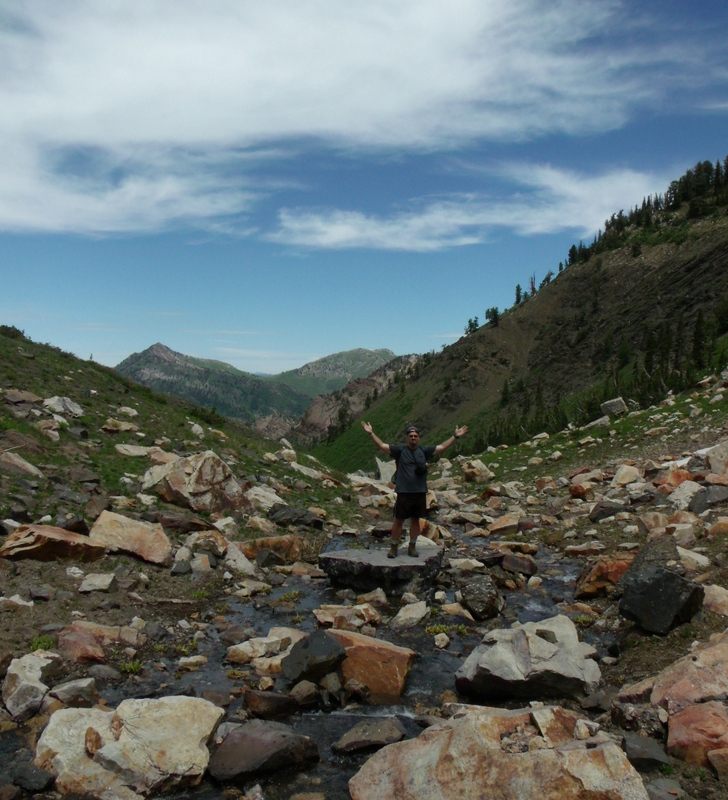 Below, my son is sitting on a rock about 50-75 yards down from the head-water, or origin, of the stream that runs the entire length of Mineral Fork and joins Big Cottonwood Stream at the other end, roughly four miles away. 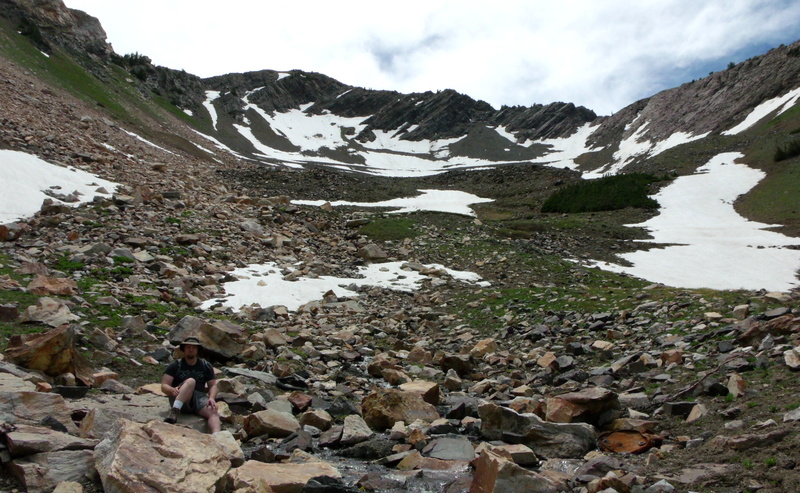 Imagine walking about that distance back up into the bowl that is behind him and listening to water running under the rocks…. It was quite loud…almost rushing, as it passed beneath the scree and finally made its way out from under the rock and became a recognizable stream…..and Holy Buddha, that was some cold water! And here I am on a rock in the middle of the nascent stream…loving my little spot in the mountains…..
My son and I followed this lower switchback trail up to the higher switchbacks (that you can see in the earlier post), but went off trail and followed the stream through its windings and droppings in elevation back down to a a similar location on the opposite side of the canyon…which affords us this distant look at the trail as it begins to climb upward. 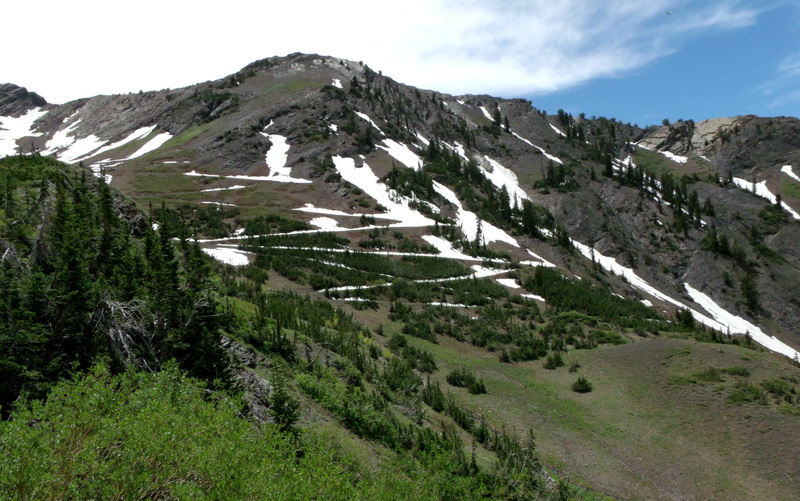 These prominent switchbacks cause this trail to be referred to as the “zigzag trail” in various literature on the area…and can be seen clearly from the mountain ridges several miles to the north. 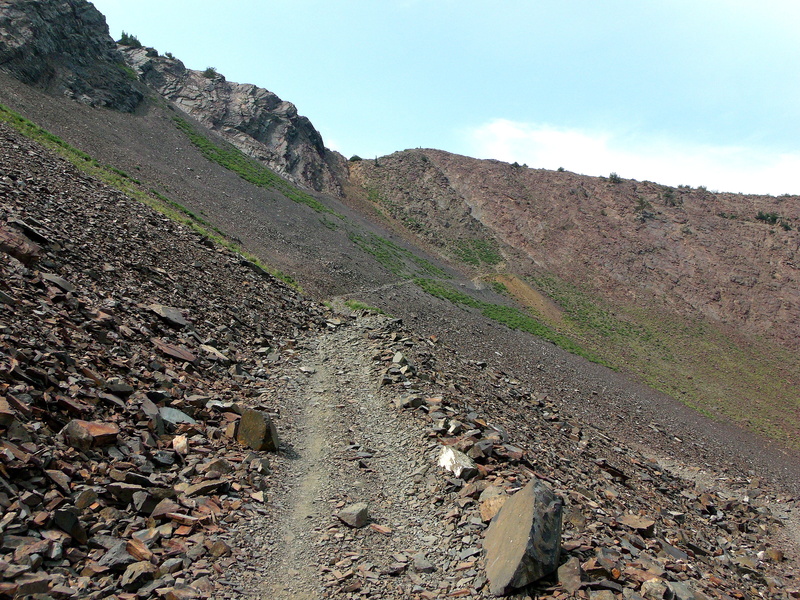 Here’s another view of the zigzag trail, below, that I’ve provided to help with scale and proportion again…. Can you see the two people highlighted against the snow…slightly below and to the left of the center of the photo? This is the eastern ridge of Mineral Fork…facing south…and illuminated with the full brightness of the afternoon sun. 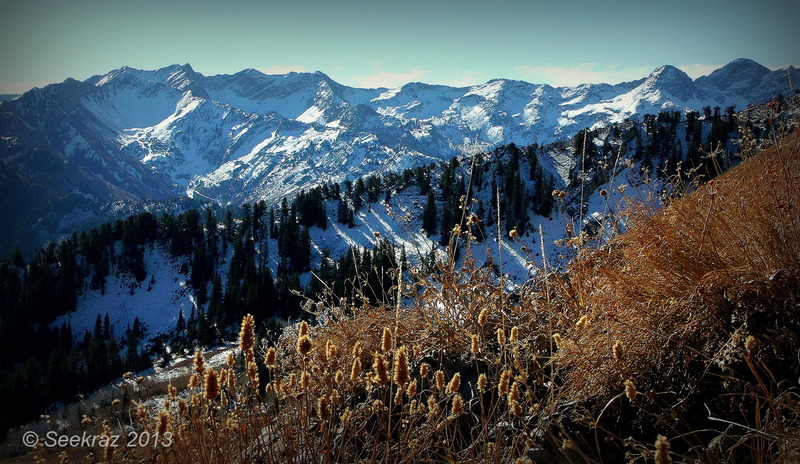 And this is a final look at Mineral Fork…looking backwards, though, toward its beginning at Big Cottonwood Canyon. 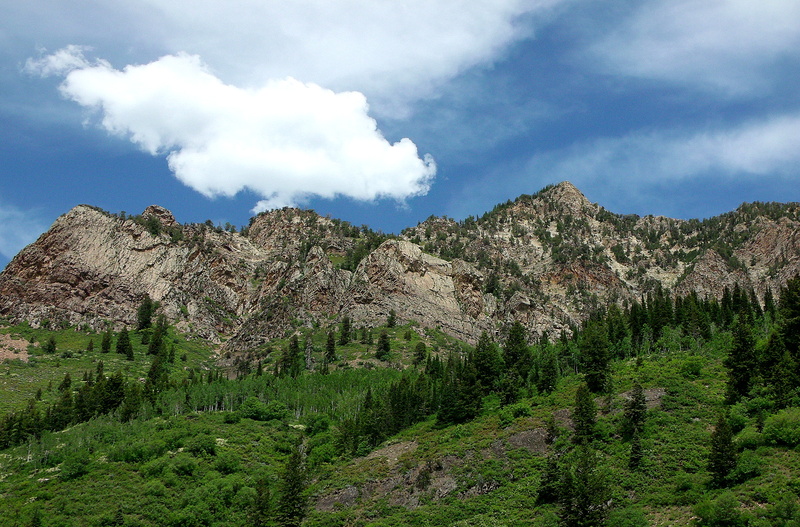 If you’d like to see a visual reference to where Mineral Fork is situated in Big Cottonwood Canyon itself, you can click on this link to be taken to my last post that includes a map of the area….find the central spine of mountains in the approximate middle of the map and then find the second purple pin up from the bottom of the image. 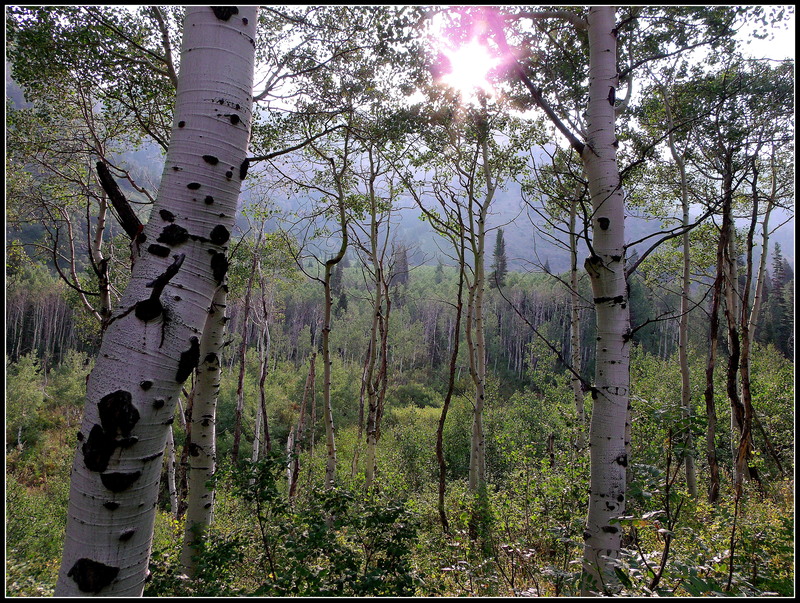 As always, thank you for being here, for spending a bit of your time with me…I hope you’ve enjoyed exploring another section of the Wasatch Mountains, just east of Salt Lake City, Utah, USA.